Now that Alicia has been taken captive by the Pirates Of SoCal, what kind of horrific torture is she being subjected to?? She’s…..eating steak in a nice-looking living area while skiing plays on the TV and Patsy Cline warbles on the stereo. Okay then. But then she learns the ugly truth that it’s not ALL okay in paradise: the pregnant woman takes away half her steak to eat it herself as soon as Connor leaves the room! If only she could be rescued from this hellhole! When we check in on Travis, he’s woken up in a cage somewhere. He may have found a method of picking the lock, but we never find out if it would have worked because he’s interrupted by the presence of the one who put him there…..out of the shadows comes…. Wait, does this means she’s a bad guy now? BOO! NO FAIR! We learn that Alex’s friend didn’t make it. They ran out of water and the guy asked not to be drowned, so Alex had to choke him to death with her bare hands. After this the pirates found her, and she gave the Abigail’s coordinates to them nearly immediately, because who wouldn’t? Alex says she could tell Strand was a jerk right away, but Travis was the one with a little heart, and he could have stopped what happened from happening, but instead just stood there. In her eyes, Travis is the one truly responsible for the death of her friend. Expecting a rebuttal, she’s shocked to get a confession. “You’re right. That guy’s blood is on my hands; I made the decision to let that happen to you. You have every right to do this to me.” Travis then tells Alex that, like her, he had to kill someone close to him with his bare hands, and he would never wish that fate on anyone, but having to struggle in the apocalypse does things to you. They can both relate to this. And thus we see the problem with Alex: she is much too smart for this show. Anybody else would have blindly put their trust in Connor after being rescued. Alex has so far come out on top in every situation she’s been in (she sure showed Travis) and it’s due to her survival smarts and sharp instincts. And since Kirkman’s universe is built upon people making terrible decisions repeatedly, she just can’t stick around. She is literally too good for Fear The Walking Dead. What a shame that is. Crazy Nick better watch it — he’s been acting surprisingly competent these last two episodes, which could mean he’ll be thrown off the ship. 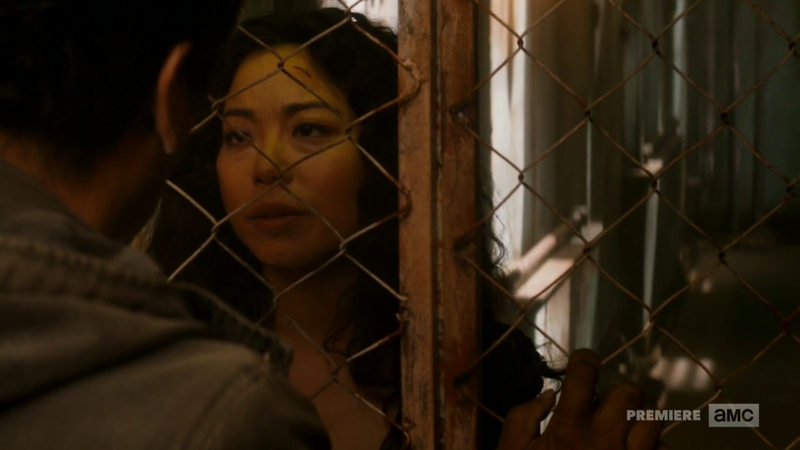 Back to Alicia, who’s being given a tour of the tuna boat she’s imprisoned in with Jack. Throughout this entire episode he is trying to butter her up and score with her, but the fact that he belongs to a family of crooks keeps getting in the way. 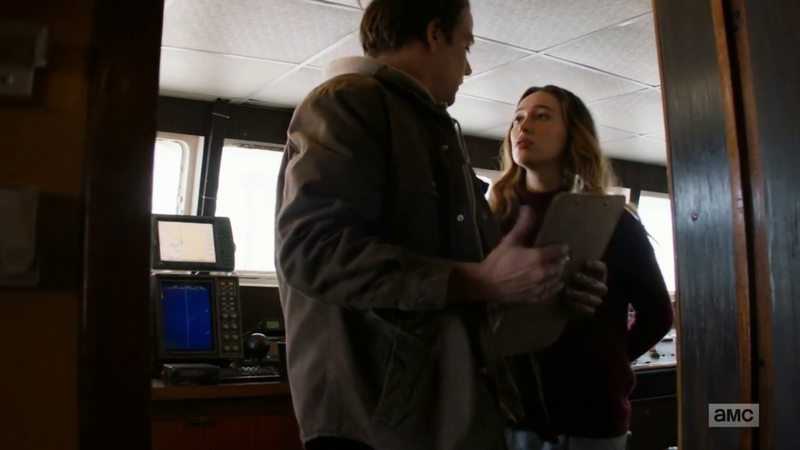 Jack shows Alicia the radar and communication deck where he first contacted her. He shows her how easy it is to find other boats in the area, and how they just pick from ’em and raid ’em, simple as that. Alicia asks about a certain pair of coordinates on Jack’s clipboard, suspicious that it’s the Abigail. 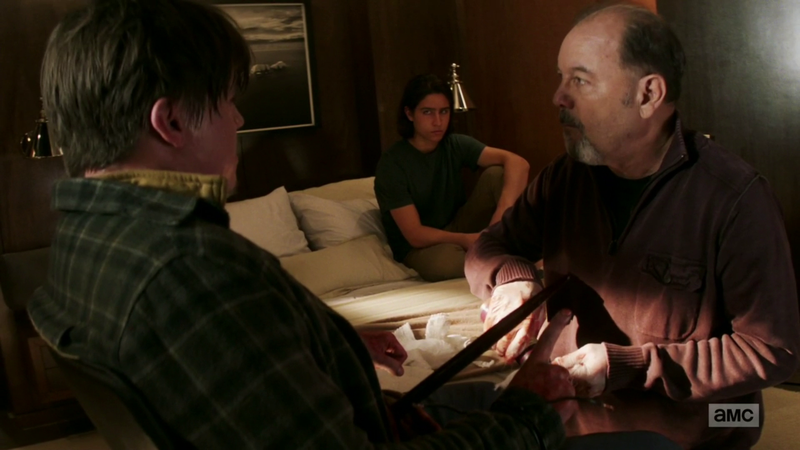 Jack says….uh, maybe, and we also might have your dad in a cage somewhere around here, but can we get back to US? 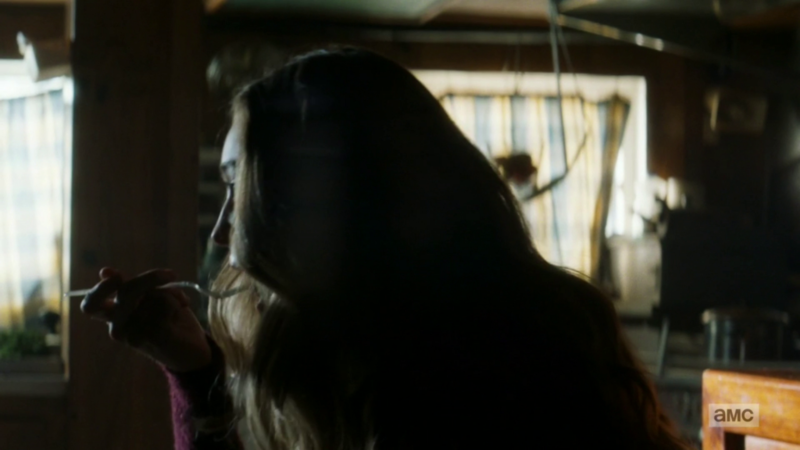 He gets a faceful of clipboard, repeatedly, and is ordered by Alicia to help him rescue her dad and escape. Jack, pretty whipped at this point, will do anything Alicia says. I’ve wondered for a long time if the practice of putting water in Christmas tree stands started as an urban legend….because what is it seriously going to do? The tree is clearly dead. This came to mind when I watched Mr. Salazar clean the area around the wound Reed, the family’s pirate prisoner, had. This wound happened to be AN IMPALEMENT THROUGH THE STOMACH, but at least now it won’t get infected! This is really bad. 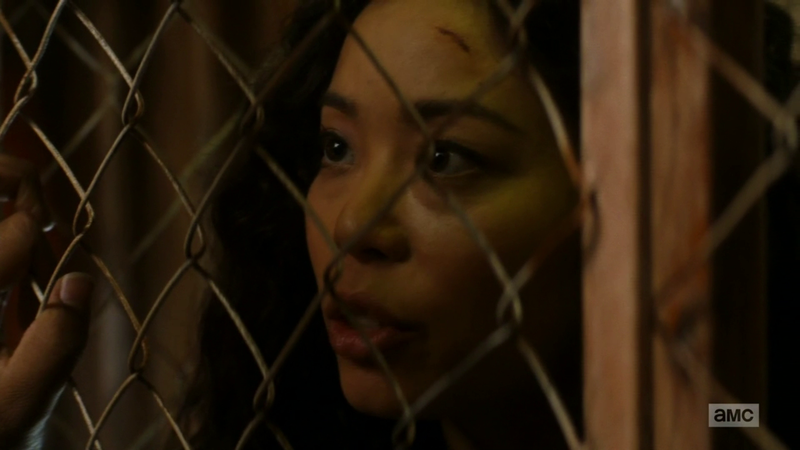 Madison had just arranged a hostage exchange, and she swore Reed was alive. They’re heading to the docks right now. What are they supposed to do with this dead….oh, wait, right, zombies are real. Reed rises up and starts growling. Mr. Salazar gets the perfect idea, which he stole from a Walking Dead comic book. They cover Zombie Reed’s head with a bag and head for the dock. The pirates are there waiting for them with Travis. Travis steps forward and Madison shoves Reed to the other side. The plan works perfectly: as soon as the bag is taken off, Reed takes a big bite out of two of them (this includes Connor). 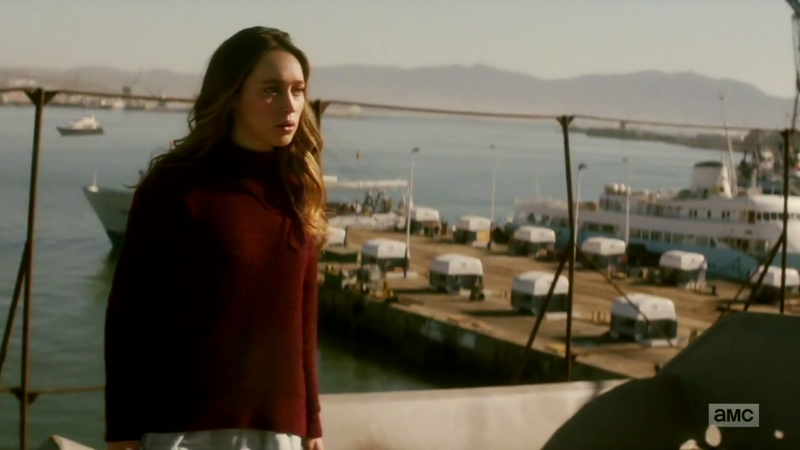 Travis then starts beating up the third guy, but he’s interrupted by the presence of Alicia, who’s standing on top of the tuna boat at this moment…. Alicia jumps into the water, Madison hauls her into the lifeboat and they head back to Abigail, never to return to this godforsaken place. The good news: no more Jack. The bad news: no more Alex.